Sterling Hill is one of the world's premiere mineral localities. Together with the nearby Franklin orebody, 2.5 miles to the north, more than 350 different mineral species have been found here — a world record for such a small area. 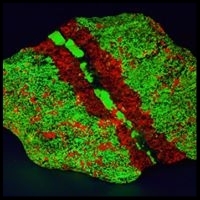 About 90 of these minerals are fluorescent and more than two dozen of these have been found nowhere else on Earth. Below, one can find a list of mineral species found at Sterling Hill and Franklin NJ. This list is current as of September, 2008 and is revised annually by the Mineral List Committee of the Franklin-Ogdensburg Mineralogical Society. 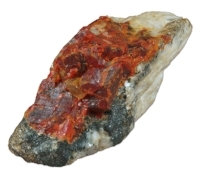 Below, one can find a list of ONLY the FLUORESCENT MINERALS OF Sterling Hill and Franklin NJ. This list is a 2008 check-list based on observations made by Richard C. Bostwick.